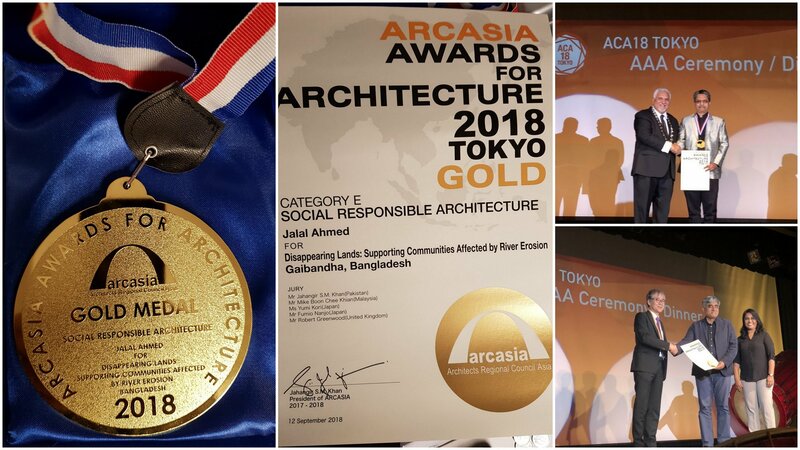 Two of the members of Bengal Institute's Executive Board, architects Jalal Ahmad and Ehsan Khan won separate awards at the ARCASIA 2018 in Tokyo. Jalal Ahmad (Principal of J.A. Architects Ltd.) won the Gold Medal for the project “Disappearing Lands Supporting Communities Affected by River Erosions ” in Gaibandha, Bangladesh in Social Responsible Architecture category by “ARCASIA Award for Architecture 2018” in a ceremony held in Tokyo on 12th September, 2018. The project focused on food security and alternative employment generation for the erosion affected and displaced resource poor communities through different innovative strategies based on disaster risk management & vulnerability reduction, adaptation to climate change issues and building awareness about social, civil and political rights. Two major components of the project were developing cluster villages and some multipurpose shelters for the vulnerable communities in the region. Architect Ehsan Khan received Mention in Social/institutional building category. Bengal Institute congratulates them both for the prestigious accolades.